Oxford scholar and founder of a literary magazine are just a couple of honors to which a young man might aspire and find himself on track for a very successful life. Michael Allmand was a man who had just that, but early 1940’s London would see the fortunes of many men undergo a radical shift. From scholar to warrior, Allmand would set out for the jungles of Asia to battle the Japanese and before it was over he would add another prestigious honor to his young life. Charging across a heavily defended bridge alone, Allmand would kill multiple Japanese soldiers with grenades and his dreaded kukri blade. On yet another occasion, he would charge at the head of his Company through marshy muddied ground swept with machine gun fire to capture his objective. And yet again to reclaim a strategically important railway bridge, he would take the lead and single-handedly charge a Japanese machine gun nest. The latter action would prove fatal, but by the end this Oxford scholar would be awarded the Victoria Cross for his actions in the jungles of Burma. Michael Allmand was born on August 22, 1923, in Golders Green, London, to a Roman Catholic family. During his childhood Golders Green was where many German Jewish refugees fled Hitler during his rise to power in the 30s and he would become keenly aware of the persecution many faced at the hands of the Reich. Allmand proved early on to have a brilliant mind and had quickly settled on a course of becoming an academic. This path would take him to Oxford as a history student where he would serve as a founding editor of a literary magazine in 1941. 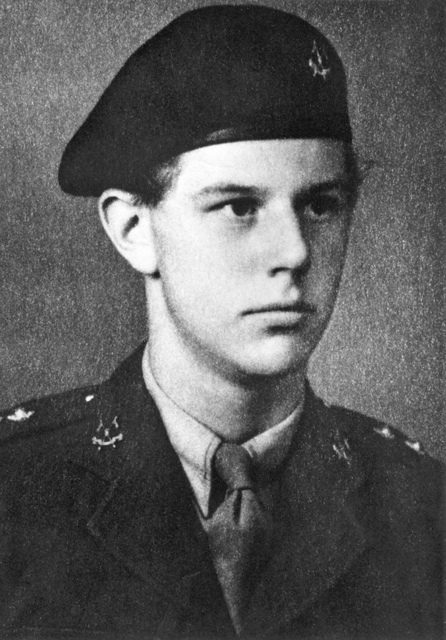 Lieutenant (acting Captain) Michael Allmand, attached to the 3/6th Gurkhas received a Victoria Cross posthumously for his actions at the Pin Hmi Road Bridge, Burma, 23 June 1944. Despite his academic prowess, as the war in Europe raged on Allmand felt the call to serve and left university to join the British Army in India. Originally slated to serve in the Armored Corps, Allmand volunteered for a Special Forces guerrilla warfare unit called the Chindits (Burmese for lion). 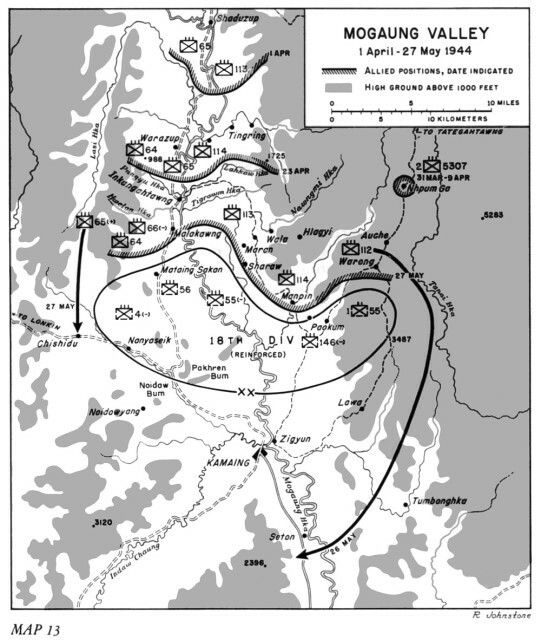 The mission which was dubbed “Operation Thursday” was to plunge into Burma and attack deep into the heart of the Imperial Japanese forces occupying the territory. Despite being an Oxford Scholar, Allmand would quickly find himself fighting side by side with the famed Ghurkas. 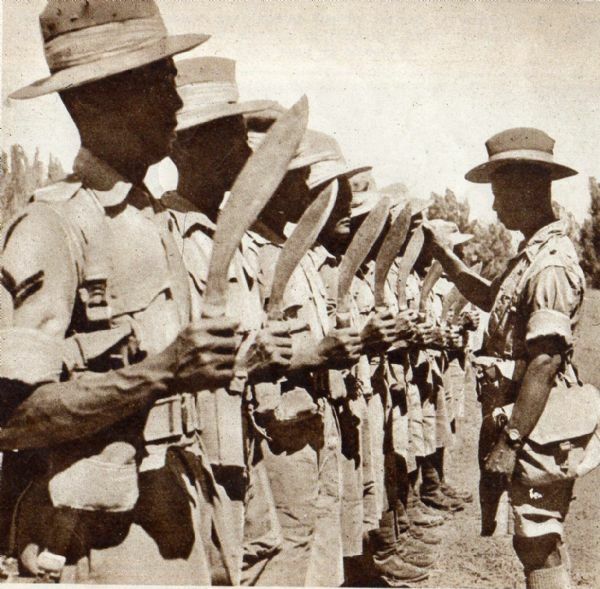 Ghurkas and their famed Kukri blade being inspected. They would avoid entrenched Japanese troops by traversing thick jungle thought unnavigable on long marches for days. Heat and disease would take its toll on the force but they would arrive at their destination and begin to wreak havoc on the Japanese forces. For Allmand, it would be a series of actions in June of 1944 that would earn this scholar a unique place in military history and the nation’s highest military honor. Battle Map of the Moguang Valley. In June of 1944, the British and Chinese operations in the area had set their sights on the city of Moguang, Burma. The Japanese were heavily entrenched in the thick jungle surrounding the city and controlled all the vital bridges to the approach. At this point, the Chindits had been temporarily repurposed to fight as conventional infantry for the assault and Allmand would find himself in charge of a Platoon readying for an assault across the bridge at Pin Hmi Road. As the platoon approached the bridge they soon found themselves in an odd calm that clearly wouldn’t last. The Japanese had dug pits along the bank of the road for cover and had established hidden defensive positions in the jungle across the bridge. When Allmand’s platoon was just 20 yards from the bridge machine gun and small arms fire opened up cutting down several men in the initial wave of fire. While the rest of the platoon scattered for cover, the 20-year-old Captain Allmand took charge. He grabbed a few grenades and charged at the Japanese positions alone. Throwing with deadly accuracy, he killed several Japanese with his grenades and then drew his kukri, a vicious forward curving knife, and attacked three remaining Japanese soldiers. Inspired, Allmand’s men charged behind their leader and overtook the remaining Japanese defenses and secured the bridge to Mogaung. Despite this obvious act of gallantry, Allmand wasn’t done leading the way just yet. 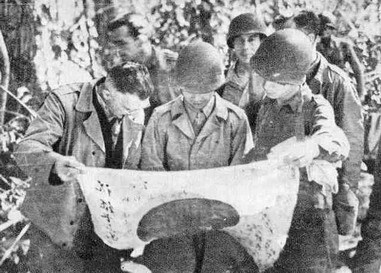 General Stilwell on an inspection tour studying a recently captured Japanese flag. Due to the casualties from the fierce combat, Allmand was forced to take command of the entire Company and would once again lead his men by example. The Company was ordered to take a ridge near Mogaung, but it was defended by enemy machine gun positions across thirty yards of marsh and tall grass. Any attack would be dangerously slow and painful exposed, but to Allmand, it didn’t matter. He knew he had to be the one to lead his men past their fear, and show them that there is never a victory without courage. Allmand charged through the marsh the full thirty yards under intense machine gun fire. Killing several machine gunners by himself. Once again inspired by the obvious gallantry of their commander, he rallied his men and led them to capture the strategic ridge. Just 10 days later, the final assault on Moguang was launched and it would require yet another bridge to be taken. As his company approached the Mogaung Railway Bridge, they were once again met with devastating fire from the defending Japanese. And yet, once again Allmand knew what it took to inspire his men to victory. Despite a severe case of trench foot, Allmand led the way through thick mud and impact craters taking on a Japanese machine-gun nest alone. Unfortunately for Allmand, this action would prove his last as he was mortally wounded. His men were able to pull him back, but his wounds proved too severe to survive. 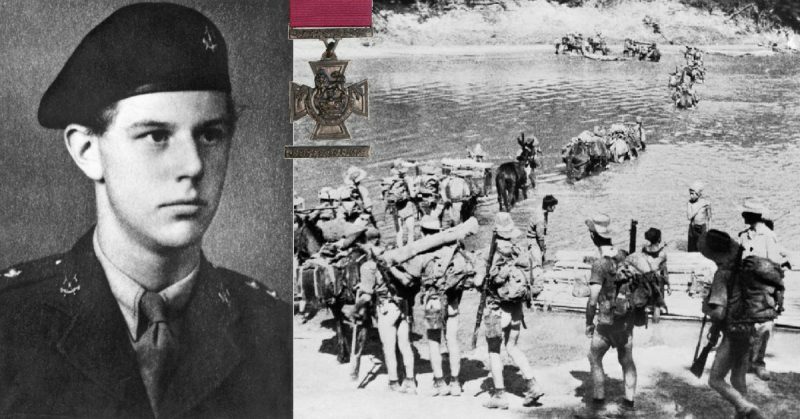 For his actions in Burma, Captain Michael Allmand was awarded the Victoria Cross. Allmand was not alone in his heroism that day. Among those recognized was Tul Bahadur Pun, a Nepalese Gurkha, who also received the Victoria Cross for an action very close to Allmand. Pun was fortunate and survived, but not all heroes survive the day. Allmand showed the same fearlessness in the enemy crosshairs, but even though his story ended that fateful day, he has not been forgotten by subsequent warriors following in his path.